My travel to CASLEO (The El Leoncito Astronomical Complex). When you find a good candidate at Disk Detective, it goes into our queue to be researched and often to be re-observed. Many of those good candidates that are in the Southern Hemisphere get re-observed from the CASLEO observatory in Argentina, where we split up their light with a spectrograph to find out what kinds of stars they are. Disk Detective Hugo Durantini Luca lives in the city of Cordoba, Argentina, much closer to the CASLEO observatory than most of us on the Disk Detective science team, but still a long journey away from it. 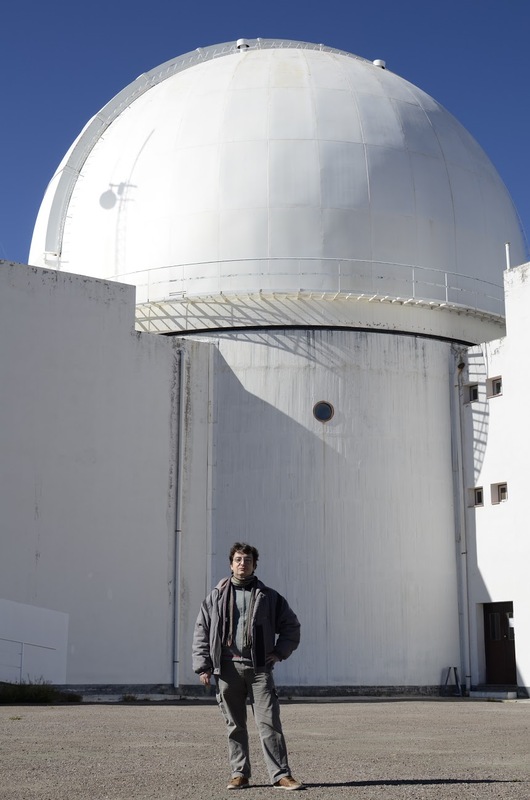 He traveled for more than eighteen hours across the country of Argentina to join a Disk Deective observing run. Hugo spent five days on the mountain with Luciano García (astronomer from Observatorio Astronomico de Cordoba) helping observe good candidates. He wrote down some memories from the trip to share with us. I think you’ll find them as inspiring and poetic as I did! Reaching CASLEO requires a little patience. Even if you were to reach the city of San Juan by plane, you still have to endure traveling approximately 5 and half hours more to reach the observatory. The landscape is very interesting, especially if it’s your first time in the region, with the mountains presenting multiple colors and the sight of the Andes while you gradually approach to its foot. Disk Detective Hugo Durantini Luca in front of the Jorge Sahade Telescope dome at CASLEO. After getting off the bus to San Juan, I was greeted almost immediately by Luciano García and we started our travel to the observatory after picking up some staff that also was going to the complex to start their work shifts. I don’t know if was because I just had made a 8 and a half hour trip, or if it was because of the landscape and the excitement, but the travel of almost 5 hours from the city to the complex felt pretty quick and we reached the place just in time for lunch. After that, we checked in to our rooms and I was able to do a small tour to see with my own eyes the telescope along with the instrument what we were about to use: the REOSC Spectrograph. The sensation of seeing all the instruments and the control room in person was almost like going back to my childhood, even though I had previously checked all available information on the internet. I must say that the first night was a bit hard, not only because at first we lost the first hour or so thanks to the clouds, but also because after we started the work and learned the basics of what we were about to do, fighting the urge to sleep and our biologic clocks was something that required a little technique. To input the coordinates of the star that we wanted to observe and then to give the order to REOSC to initiate the exposure was a great privilege. I was assigned this task for the whole run. But even repeating this process over and over didn’t diminish the excitement of directly generating new data for our research. Another amazing experience was to go outside of the telescope and be able to contemplate the Milky Way in a clean and clear sky. I saw details that are impossible to see from the city due to light pollution, treasures that the people that have never left the city or studied astronomy don’t know they are losing. It was really fun and illuminating for me to participate in all the nights, to watch how the instrument behaved according to the magnitude of the stars. I learned how to add more or less time to obtain a good reading and how in some cases, there is no trick aside from perseverance. All this experience brought me closer to a better understanding of the work of an astronomer beyond all the commons fantasies that one can hold. The second day was much easier than the first, at least in the sleep management department. Even if your body is still complaining about some things; one can feel how it adapts to the day to night change. The second night was when we ended doing most of our brightest stars because even if they can be a little difficult, there is less exposure time required. I also had the chance, thanks Luciano, to explore and visit a few sites close to the complex. The landscape and autumn colors, views almost like paintings, and the lonely roads added to the unforgettableness of the trip. All the CASLEO staff that we had the opportunity to interact with were extremely kind and it was like being at home almost all the time. Even though we were just there four days, by the end, I felt like I had been there for a long time. The return trip was somewhat bittersweet. You miss home, but at the same time this experience has reinforced to the max my love for science and especially astronomy. To pass days far away and entire nights collecting information can look like something disconnected from reality, but it’s actually the opposite. To gain consciousness of the scale of our Galaxy and our place in the universe is an experience that makes you humble, and being able to participate in building our knowledge and understanding of the universe fills me with a sense of obligation to others here in our own world. Thank you for telling about your experiences.